Nico Rosberg has revealed he struggled with a lack of self-belief after watching Mercedes team-mate Lewis Hamilton dominate the early phase of this season. Hamilton triumphed in three of the opening four races leaving Rosberg 27 points adrift in the battle for this year’s Formula One World Championship. But the German, who celebrated his 30th birthday earlier this week, secured a lights-to-flag victory in Spain before he was gifted victory in Monaco. He also won last time out in Austria to head into this weekend’s British Grand Prix at Silverstone only 10 points shy of his team-mate in the Brackley-based Mercedes team. “For sure, doubt is a part of it,” said Rosberg. “I have learned to keep believing, to push through and overcome the doubts. 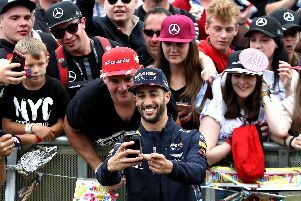 Hamilton will be roared on by an expectant home crowd with circuit organisers predicting 140,000 fans will descend upon Silverstone on Sunday. But Rosberg, who was on course to win here last year before a gearbox problem struck, is hopeful of upsetting the patriotic support. “It is important for me to keep closing the gap to him, and I am going to try and do it here,” added Rosberg. “It is a good period in the season for me and I want to keep that going. Hamilton, who revealed he missed last week’s in-season test in Austria following a “doctor’s check-up”, is bidding to win his third British Grand Prix this weekend. In each of the two previous occasions he has triumphed at Silverstone - in 2008 and here again last year - he has gone on to win the title. “It is going to be a very hard weekend as Nico has been very quick,” said Hamilton. “This weekend is going to be down to a good qualifying and extracting the most from the race. “I feel good coming here this weekend particularly knowing the great turnout.